Photo by Kelly Gorham, MSU. Services provided by the Schutter Diagnostic Lab include diagnosis of plant diseases, insect damage, and environmental plant problems, as well as visual assessment of herbicide injury to plants. We also provide identification services for plants, insects, and mushrooms and give management recommendations when needed. Safeguard Montana agriculture, landscapes and public spaces from plant pests by providing identification services, management advice, and education. Minimize pesticide use by accurately identifying plant pests and providing science-based options for management. 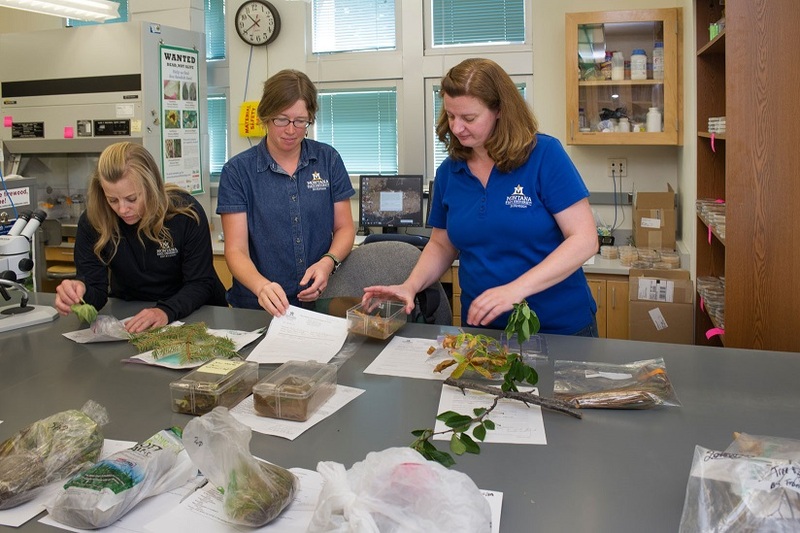 Detect new and invasive pests that pose a risk to Montana and to the U.S., so they do not become significant limitations to agricultural production and international trade. John and Grace Schutter, a Manhattan-area seed potato growing family, made a substantial financial contribution to the Montana State University Plant Bioscience Facility. Their contribution funded the creation of the Schutter Diagnostic Laboratory in this facility and two scholarships for students in the MSU College of Agriculture. The Schutters moved to the Manhattan area from Holland in 1947 and began farming the following year. They began growing potatoes in 1952 and have built the business into one of the largest and best seed potato operations in the state. John Schutter served on the board of the Montana Seed Potato Improvement Association for many years, and now his son, Sid, is on the board. John Jr., Carl, Nick and Clifford also are involved in the family's potato business. The family has been heavily involved in MSU research, and all of the Schutters' children have attended MSU. The Schutters also have three daughters in the Manhattan area: Wilma Logterman, Sharon Kamp and Marian Kimm. Great Plains Diagnostic Network, National Plant Diagnostic Network, USDA National Institute of Food and Agriculture, Montana State University College of Agriculture, Extension Service, and the Departments of Animal & Range Sciences, Land Resources & Environmental Sciences, and Plant Sciences & Plant Pathology, and the MSU Entomology Group.